A top Pakistani govt source said Islamabad has decided in principle to take on the JeM leadership to de-escalate tensions with India. Lahore: The Pakistan government in order to de-escalate the tensions with India, has decided to launch a crackdown on terror outfit Jaish-e-Muhammed (JeM) chief Masood Azhar, according to a top government source while a media report said Sunday that Islamabad may even withdraw its opposition to the move to list him as global terrorist in the UN Security Council. “The government has decided in principle to launch crackdown on the leadership of the JeM (Azhar),” the source told PTI. He said the action against JeM in the country is “expected any time soon”. “In order to de-escalate the tensions between India and Pakistan, the Imran Khan government has planned action against the JeM,” the source said. “This will be another significant move of the Imran Khan government to de-escalate tensions after handing over the captured Indian pilot to his country,” he said. To a question about the Azhar’s fate, the official source said he cannot confirm whether he would be put under house-arrest or taken into custody. According to a media report, a security official hinted that Pakistan may withdraw its opposition to the listing of JeM chief as global terrorist by the UN Security Council. “The state has to decide whether individual is important or the larger national interest of the country,” the official was quoted as saying in the Express Tribune, when asked if Pakistan would no more oppose the UNSC action against Azhar. 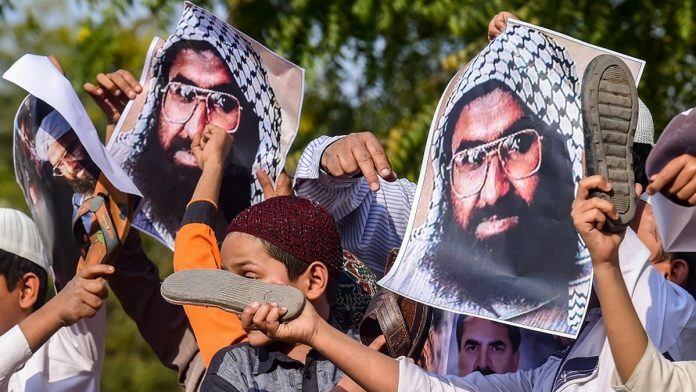 The US, the UK and France last week moved a fresh proposal in the UN Security Council to designate Pakistan-based JeM chief Azhar as a global terrorist, a listing that will subject him to global travel ban, asset freeze and arms embargo. The Security Council Sanctions Committee will consider within 10 days on the fresh proposal moved by the three permanent veto-wielding members of the 15-nation Security Council. The proposal is the fourth such bid at the UN in the last 10 years to list Azhar as a global terrorist. In 2009, India moved a proposal to designate Azhar, whose UN-proscribed JeM claimed responsibility for the suicide attack against Indian security forces in Pulwama on February 14 in which over 40 Central Reserve Police Force (CRPF) personnel were killed. When contacted Pakistan Information Minister Fawad Chaudhry said: “The government has taken action against the proscribed organisations including JeM in the past and any future action against them will be taken in the light of the National Action Plan (NAP) and our commitments in connection with the Financial Action Task Force (FATF) and not on Indian pressure,” he said. He said the Punjab government has taken the control of a seminary and a mosque in Bahawalpur as per the NAP requirements.